"an earnest and thankful prayer"
This week I am thankful. Thankful that we have been able to go on an amazing holiday to The Maldives, where we met some lovely new friends and saw some beautiful sights. Thankful that in times of economic uncertainty we have both found out in the last few weeks that our jobs are secure, with strong futures ahead. Thankful that when the busy working day is done we get to come home and sit in our peaceful garden and enjoy the food and drink that is always in the fridge. Thankful that we have a health service available to us that will monitor, support and hopefully allow us to become parents. But most of all I am thankful that when I am looking out of an aeroplane window marveling at the islands dotted below, or excited to get a promotion, or looking at an empty wine glass Sion is next to me. I am especially, especially thankful that he was there last night when I managed to ride my bike halfway into a privet bush in our garden...those things have sharp branches! 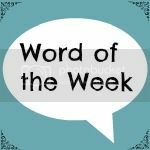 As always I'm joining in this week with the fabulous Jocelyn over at The Reading Residence to read more great Word of the Week posts - go on...pop over and take a look at a few others!